This soup hits all the best flavor points: it's savory, slightly spicy, and slightly sweet. Easily made Whole30 compliant. Using sauté setting – add ghee, leeks, and 1/4 teaspoon of salt. Cook for 3-4 minutes, until leeks soften (but not brown), stirring frequently. Add garlic and vinegar and continue sautéing for one minute. Add apple cider and turnip greens. Cook for 2-3 minutes, stirring constantly until greens wilt. Transfer greens and leek mixture to a bowl (including liquid) and set aside. Continuing on the sauté setting – add sausage to pot and brown thoroughly, making sure to break up the meat as much as possible. 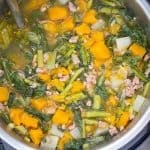 Once sausage is brown, add butternut squash, turnip roots, and 1 1/2 teaspoons of salt to pot. Add chicken broth and mix well. Lock lid and cook at high pressure for 3 minutes. Once cook time is complete, quick-release pressure. Pour greens and leek mix back into pot and mix well.